Even as the roadshow of newly appointed Congress general secretary in-charge of Eastern UP, Priyanka Gandhi in Lucknow on Monday witnessed near hysteria among party leaders and cadres, Congress president Rahul Gandhi announced the party would henceforth play on 'front foot' in Uttar Pradesh. Addressing a roadside public meeting in the state capital en route to the party’s state headquarters from Lucknow airport, Rahul Gandhi said while Lok Sabha polls were definitely on radar, but the party was also eyeing victory in 2022 UP assembly polls as well. “I have tasked Priyanka and Jyotiraditya Scindia ji (the former union minister has been made the in charge for Western UP constituencies in run up to general elections) with ending the injustice prevalent in the state for years...now we will play on front foot and not backfoot,” Rahul Gandhi said amidst shrill pro-Congress slogan shouting by zealous party cadres. His clarion call is not only meant for the BJP, but also a subtle warning to the Samajwadi Party-Bahujan Samaj Party (BSP) combine, which had announced their truck last month, leaving Congress in the lurch in the high prized state of UP, which elects the maximum number of 80 Lok Sabha members and is key to any government formation at the Centre. Rahul Gandhi underlined Priyanka, Scindia and he himself would not rest until they dislodge the current BJP dispensations and install a Congress government of the poor, youth and farmers even as he likened UP to the heart of India. While thanking the people of Lucknow and party supporters for the overwhelming support to the roadshow, Rahul slapped his oft-repeated jibe on Prime Minister Narendra Modi ‘Chaukidaar chor hai’, which the Congress workers shouted thrice in unison. 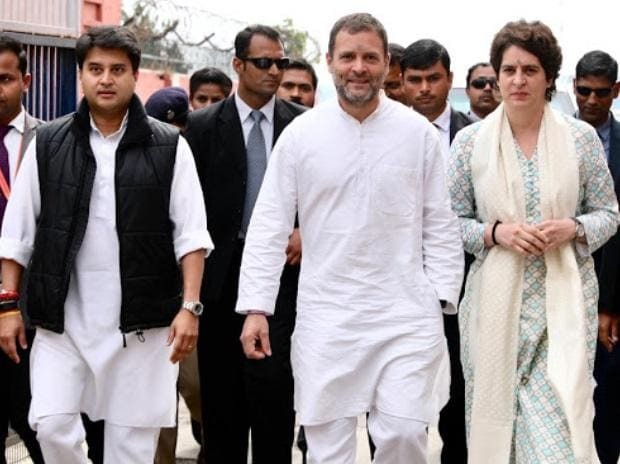 Earlier, Rahul, Priyanka, Scindia and senior party leaders had arrived in Lucknow around noon and proceeded in a massive cavalcade for the roadshow, which witnessed good turnout of the people and supporters after a long time for the grand old party of India. Congress had filled the thoroughfares of Lucknow with giant billboards, posters and banners to amplify Priyanka Gandhi’s purported charm offensive. The entire 25-30 km route from airport to Nehru Bhawan, the UP Congress Committee (UPCC) headquarters, in the posh Mall Avenue area in the heart of the city sported her billboards. In fact, Priyanka even subdued her elder brother Rahul Gandhi in these billboards going by the size and positioning of their respective images and theme. Their cavalcade was welcomed by local party leader with garlands to give it the feeling of a victory procession. However, the dangling overhead electricity cables posed some problems for the top Congress leadership waving to supporters atop a customised bus. Later, Priyanka and Rahul alighted from the bus and continued with the roadshow atop an SUV. During her Lucknow sojourn, Priyanka would hold parleys with senior leaders and cadres to take the stock of the ground situation before finalising the poll strategy and probably names of candidates as well. Hitherto, Priyanka had restricted herself to the party’s twin pocket boroughs of Rae Bareli and Amethi, which are represented in Lok Sabha by Sonia Gandhi and Rahul Gandhi respectively. Priyanka would manage 42 of the 80 Lok Sabha constituencies in UP with Scindia taking the charge of the remaining 38 constituencies from Unnao and beyond till the National Capital Region (NCR).